Based on the popular comic book by Dark Horse Comics and making his second appearance in the big screen Hellboy II The Golden Army proves that action and entertaining wise the ugly reddish devil like creature can play with the big boys such as Spiderman, Hulk, and Batman, in bringing an exciting and exhilarating sequel that would hypnotize the viewers from the first moment it begins. The movie combines a magical and creative world in realistic environment, well used of comical remarks, and emotional situations that makes it just fun to watch. Guillermo del Toro proves once again why he has become one of the most acclaimed director of this times by delivering us what I consider an old and play out story in a highly entertaining appealing superhero movie. Long ago there was and Elf King named Balor who's army fought against humankind, for humankind was greedy and hollow in the inside. The humans grew stronger and almost put an end to all the other invisible creatures from the magical realm, the king grew sad for all the destruction, and since everything he had done to prevent war failed King Balor had not other choice than becoming weary of the war. Some of his minions decided to build an unstoppable army that would destroy humankind and bring victory, but when the King saw the Golden Army, and the path of destruction it had created, he grew sadder. So much blood was scatter in the land, the King decided to make a truce with humankind to declare peace and put a stop to their battle. King Balor proposed a Truce with the humans and he divided the Golden crown, which controls the army, into three pieces and gave one to the humans as a sign of honor and friendship. The king’s son, prince Nuada, did not agreed with this decision arguing that humans were not to be trusted, for that he decided to go in exile. Now in this age and times Prince Nuada has decided to return and claimed what is rightfully his, the third piece of the golden crown. The truce between humans and creatures have been broken. The world will go up in flames and the Golden Army will once again awaken. Now humanity’s faith rest in a group of elite government agents from the Bureau for Paranormal Research and Defense (BPRD) a Human torch like woman, a fish man, and a huge red devil like creature, Hellboy to stop Prince Nuada for waking the Army. As I watched the movie’s different trailers my expectations grew bigger and bigger, and I do not considered myself disappointed after watching the movie. It satisfy me enough, and I dare to say that it is one of the best sequel movies I have ever seen. It is right there in the top with Terminator2 and Spiderman 2, however, I could not managed to compare this movie’s elements with some other great blockbuster movies, to me, Hellboy II was a combination of: the special effects of Lord of the Rings, plus the storyline of Indiana Jones and Raiders of the Lost Ark, plus the comedy of Men in Black, plus the magic of Pan’s Labyrinth, and plus the hero’s dilemma of the X-Men and/or Spiderman. Visually is phenomenal, there is nothing wrong with the movie, if for some reason the audio were to fail the audience would be pleased just by looking at it, the amazing and breathtaking settings, the original and imaginative characters, the can not stop watching action sequences everything looks fantastic, the only disappointment visually for the movie is when Liz Sherman uses her powers do not seem as impressive as the fantastic 4‘s human torch. The acting is also a high point in this movie, everybody did and outstanding job performing their character, specially Ron Perlman. He owns that character. He is Hellboy as Harrison Ford is Indiana Jones or Arnold is the Terminator. However the story and ending although masterfully told and entertaining, I found it highly predictable. Another aspect that I like about the movie is the side stories. In the chase for the Golden Army the audience get to know more about this superhero’s persona. 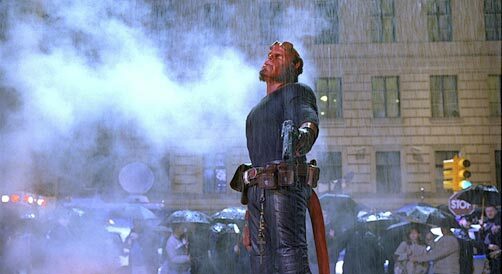 Hellboy although huge, strong, powerful, and different looking, is affected by feelings that define the human condition. He wants to belong, to be loved, to be acknowledge, to have fun, and to protect his love ones. The director shows this and also makes a critique of how we, humans judge thing for what they look like and not for what they are. The story between Princess Nuala and Abe Sapien, and the link of Prince Nuada and Princess Nuala although easily predictable is also a great addition to the main plot. Guillermo del Toro and his cast did once again a great job bringing this character to live. He is appealing charismatic and lots of fun. I hope that in case of a third part, writers, director, and crew come along just like they did for this one, although more originality on the scrip should be needed. For superhero movie fans, watch it you will not be let down, and although it might seem as it recycles elements from previous movies, Fortunately, for the audience these elements are ingeniously well mixed with exacted precision by the director and actors making Hellboy II a great an interesting Summer movie that is more than the sum of its parts.